Where does a 470-mile mountain bike race sit? I haven’t been very subtle about my Colorado Trail ambitions. My last two posts have focused on the race, and my preparation for it. I’ve been telling anyone who will listen about the race, and all my various gear choices. I’ve sent 2,379 emails to Ty, my neighbor, and fellow CTR hopeful. 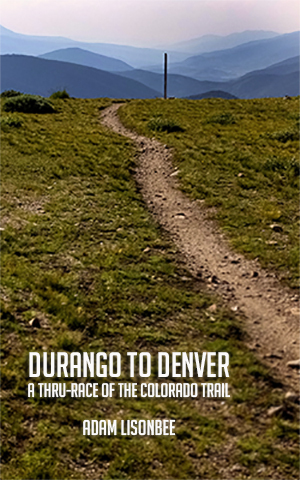 * But having my thoughts be dominated by a ride like the Colorado Trail Race shouldn’t come as a surprise. The only way I can get prepared for, let alone finish, anything that is this far beyond my previous experience level, is to become utterly obsessed with every detail about the endeavor. *It’s all his fault anyway. He’s the one who pushed me from doing the CTR “someday”, to doing it now. Getting ready for the Crusher, The KTR, the Dixie Lite, and even cyclocross and cross country racing, has kept me awake many nights in the past as I’ve pondered gear choices, route descriptions, elevation profiles, weather patterns, and training strategies. The mental and emotional focus can be tiring, but it’s also a lot of fun. What have I gained from all this recent studying? My criteria for choosing gear has been simple: find the lightest piece, for the lowest price. So far, budget has trumped weight, although I’ve been able to find some very nice gear for very nice prices. There’s nothing quite as satisfying to a dirtbag as finding high-end gear for low-end prices. I’ve also been able to use a lot of gear that I already had, which is nice. I’ve listed the total weight for the commonly weight-analyzed items, and although I do have total weights for everything hidden away on my spreadsheet, I haven’t included them here. I’m not being secretive, I just think some of the details will change between now and July, and that the weights of tubes, lube, and other mundane bike necessities are all pretty standard. It’s also worth noting that while this list is CTR-centric, most of it applies to any bikepacking route. *Feel free to make any suggestions for improvment. This year I am riding a 2011 (but only recently built) Cannondale Scalpel. 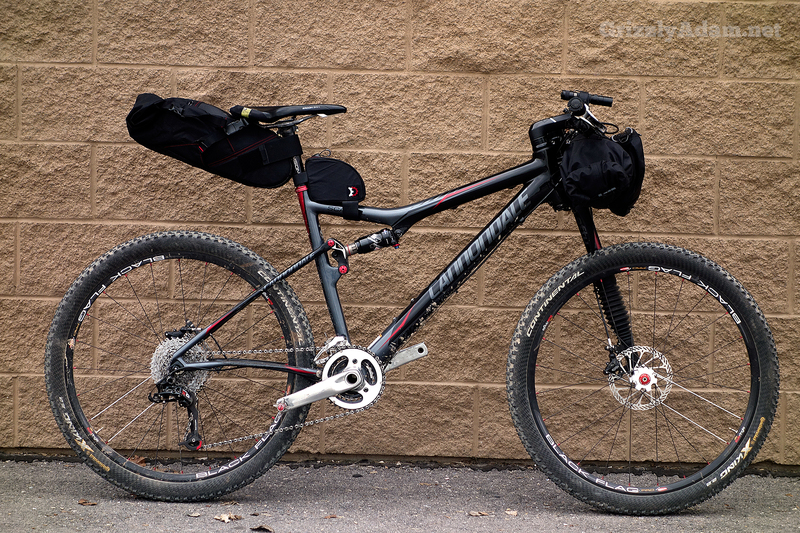 Currently it weighs about 22 lbs with beefy 26-inch wheels and tires. I am planning to use a lighter set of 650b (27.5) wheels and tires for the majority of my riding and racing. It is built with a mix of SRAM XO and Cannondale SI components, along with a couple of my own additions from Thomson, Ergon, and Enve. Riding the tiny wheels after years on a 29er has been fun. I like the bike, but we’ll see how I feel about it (or any other bike) on or around July 26th. The primary difference between backpacking and bikepacking is (obviously) the bike. Instead of having to carry everything on their backs, bikepackers can let the bike shoulder some of the weight. And the best way to do that is with lightweight bags. The days of panniers and racks are over. Bike bags have become the established standard in multi-day touring, are much easier to obtain than they were a few years ago, are durable, waterproof, and fit on just about any bike—road, ‘cross, or mountain. I’ll be using an array of bags, hand-made by Alaskan Eric Parsons at Revelate Designs. Eric is a pioneer in the bike bag world, and his gear is over-the-top nice. I’ve narrowed my backpack choices to two: the Wingnut Enduro or Camelbak Volt. The Wingnut is a proven winner. I’ve used it on many long rides and multi-day trips. It’s light (16oz. ), large (18L), and is 100% waterproof. The wing pockets make fishing for food on the go ridiculously easy. The Volt is another possibility, although I don’t have one, and have no experience with one. But the lumbar reservoir (which I’ve liked in the past on other packs) and the smaller volume have distinct appeal. I tend to fill any available space in my pack, so a smaller volume could help me leave unneeded stuff behind, or move more weight to the bike and off of my back. An integral part of any multi-day gear list is the sleep system. It consists of three primary pieces: shelter, bag, pad. The variations of each of these items are vast, and like most outdoor gear, is subject to a triangle of compromise. When it comes to sleeping in the wilderness, pick 2: comfort, lightweight, cheap. However, modern advancements in materials are slowly eliminating that compromise, making affordable, light, and comfortable gear a lot more attainable. It’s pretty easy to build a 3-piece sleep system that is waterproof, comfortable, and under 3 pounds. An event like the Colorado Trail Race (or any multi-day race) has an added element of compromise: speed. Going fast means going light, but it also means keeping everything very simple. The fastest CTR finishers have spent less than 5 hours in their shelters each night, often making due with nothing more than an emergency bivvy and a down jacket. They sacrificed comfort (and some safety) for the simplicity and light weight of a just-good-enough sleep system*. Finding a place to hang a hammock, or futzing with a tarp and stakes at 2AM, after 20 hours of riding isn’t simple. When I’m done riding each day, I want to crawl into a waterproof tube, and sleep. *Just-good-enough probably kept the pointy end of the group moving, instead of spending time trailside, snoozing away the chance at a record finish. Which is one reason why they are at the pointy end. Hmmm. 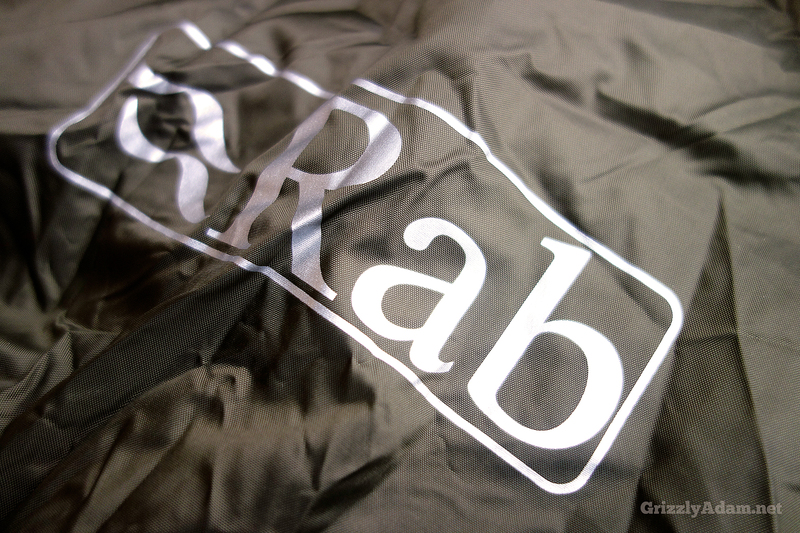 Bivvy: Rab Storm. I found the Rab Storm Bivi at the bottom of a clearance bin at my local gear shop. The price was right, and so was the feature list: waterproof, breathable, and lightweight. At 16 oz. it is 8 oz. lighter than my fully-featured, and very comfortable OR Aurora shelter. But giving up a little extra comfort in the sack in favor of shedding 1/2 a pound on the trail is an easy tradeoff. And it’s not as if the Storm is exactly minimalist. It zips closed, and is fully waterproof. I don’t anticipate missing the added features (bug net, pouch, Gore-Tex) of the Aurora. Sleeping bag: I’ve used the Lafuma Warm ‘N Light 600 down bag for the last several years, including on the Dixie Lite. It’s a great summer bag. It is, as its name implies, warm, and light (35 degree, 21 oz.). But (and this question plagues everyone), I have been wondering if I could find something lighter. There are, obviously, lighter sleeping bags available, but they fail my budget test. The compromise? 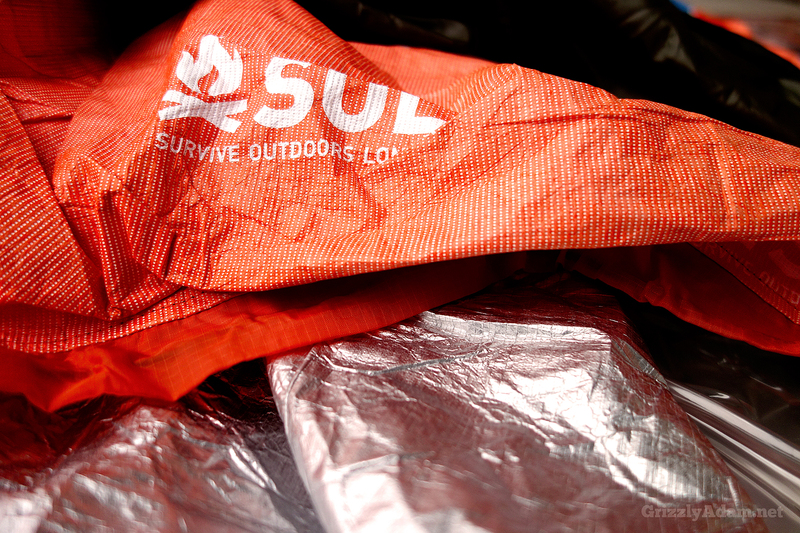 The SOL Escape bivvy from Adventure Medical Kits. At 8 oz, the Escape weighs 13 oz. less than the Warm ‘N Light 600. It’s advertised as water-resistant and breathable. Reviews are upholding that claim. Last year’s CTR winner used the Escape as his primary shelter en-route to a record setting finish. * I strongly considered using one as my shelter this year, but will instead use it as my sleeping bag. Will it be as comfortable as a down bag? Probably not. But used with the Storm Bivi, and my sleeping pad, I will stay warm and dry. *The Escape didn’t get much use. He finished the race in just 3 days, 23 hours, and 38 minutes. Sleeping pad: A good sleeping pad can make the difference between a lousy sleep system, and one that helps you get the rest you need in-between 20 hour days. The new trend in ultra-light pads is thick, but light. I’ve retired my 3/4 inch Therma Rest Pro-Lite 3 (which has served me well for several years, and will continue to serve my kids) in favor of the 2.5 inch Big Agnes Clearview Air Pad. It’s fat, affordable, really light (11 oz) and longer than my Pro Lite. It’s the one piece of my sleep system that I consider a luxury. I want to be able to rest at night, and this pad is going to help me do that. All three items will be rolled into a small dry bag, and stowed in the Sweet Roll. A multi-day trip requires a few extra clothing items, beyond the normal riding shorts, jersey, and gloves. Any route where wide variations in the weather are probable (like the Colorado Rockies) will lengthen the clothing gear list a little. However, eliminating redundancies and paying attention to item weights can shorten that list, and lighten the pack. Down vest: The Montbell UL Snap Vest is one of my favorite pieces of gear. I’ve used it while mountain biking, ski-touring, summer and winter camping, and backpacking. It’s one of the few items that I include in every over-night pack. It will be an important part of my CTR sleep system, adding warmth to the entire set-up, or doubling as a pillow if the temperatures do not require it to be worn. It can also be slipped on while hiking and riding during cold snaps or early morning high-speed descents. At 5 oz. it has the highest weight/usefulness ratio of any of my clothing. Wind shirt: Useful while riding, in light rain, or as an add-on during cold nights in the bivvy. I use the Brooks LSD Lite Jacket. It’s hooded, and only weighs 4 oz. Rain Suit. I have one demand from a rain suit: keep me dry. And be light. So, two demands. And cheap, it has to be cheap. Which makes three demands. Cheap, light, dry. The DriDucks Frogg Togg UL meets all three. The entire suit (hooded jacket and pants) weighs less than 11 oz., costs about $20, packs up nice and small, and most importantly, keeps water out. It isn’t very durable, but the set I’ve had for 5 years is still hanging tough, although it will probably be replaced this summer. Long underwear: The last thing I want to do after a long day of pedaling is sleep in my chamois. A nice set of long underwear will not only let me hang my shorts on a tree to dry overnight, but also help keep me warm during the night. Paired with my sleep system, and down vest, I should be cozy on all but the most extreme summer nights. Plus, I can always pull them on during the day if needed. Silk underwear in the mountains? Heck yes! Hat: A merino wool or synthetic stocking cap is a must-have. At only 2 oz, it doesn’t weigh much, but can add a lot of warmth when needed. Other: warm gloves, waterproof socks, sleep socks, arm/knee warmers, vest, base layer. Riding a bike on a multi-day trip is a little like bringing along a temperamental significant other. That is, it’s going to be high-maintenance, require a lot of attention, and weigh down your pack a lot more than if you had left it home. But there are benefits (to the bike) as well. Chief among them, wheels. Rolling is faster, and a lot more fun, than walking. Helping to keep the bike rolling is a long list of tools and parts, many of which will hopefully stay tucked away for the duration of the trip in some forgotten pocket. Fenix lights are small miracles. 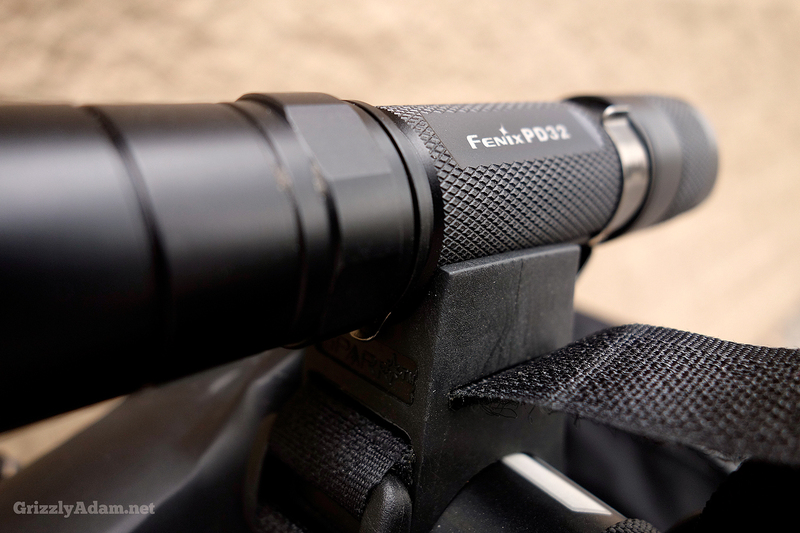 I’ll be riding the CTR with two Fenix PD32 flashlights. The PD32 runs on two CR123 batteries, and will burn at 130 lumens for 8 hours (315 lumens for 2 hours). Each light weighs about 4 oz. with batteries. I’ll have one on my helmet, and one on my bars. I’m really impressed with these little lights. They are better than most of the bike-specific offerings from the major players in the market. I’d use 2 of them in a 24-Hour lap race as my only light source with confidence. Where were these during my solo-24 days? Most bikebacking trips require a GPS, or detailed route knowledge. Or both. GPS technology has come along way in the last 10 years. Units are easier than ever to load tracks and maps on to, they are light, affordable, and really capable. 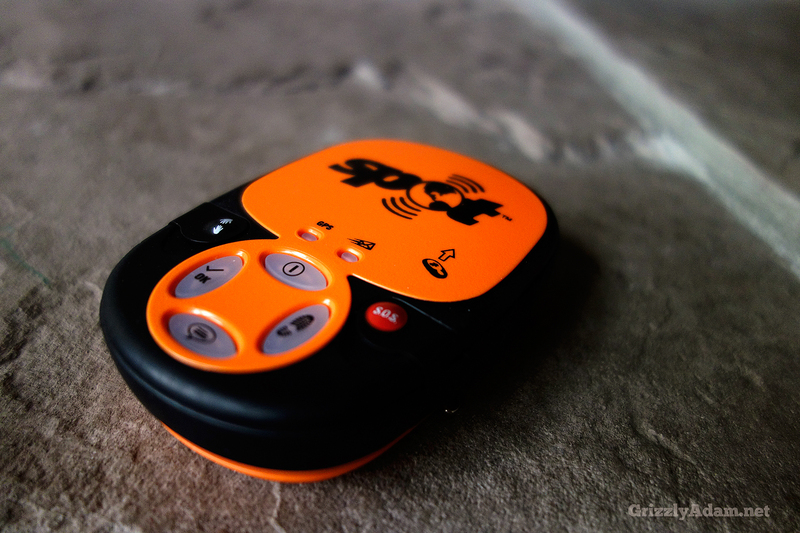 Most of them include a lot more features than just GPS. My favorite units over the years have always (and forever?) 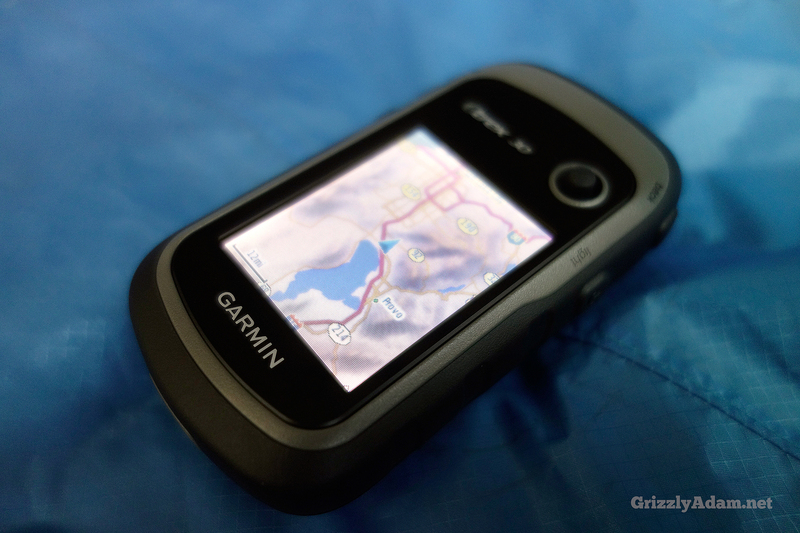 come from Garmin. My multi-day choice is no different. And while I tinkered with carrying my trusty Edge 705 on the CTR, I decided on the AA powered eTrex 30. Either way, I was going to be carrying batteries, but with the eTrex, I don’t have to bother with a AA powered charger or the shorter run time of the Edge. Staying safe (alive) in the mountains requires a combination of the right gear, and the right mindset. I’ll have a small first aid kit, and a SPOT, but I’ll also have everything else I’ll be carrying. My clothing, sleep system, lights, navigation equipment, food, water, and tools, can help prevent (or get me out of) a dire situation. First Aid: LifeLine 1-person trail kit. I like water filters. But after I broke the handle on one in the Uinta mountains, I’ve wondered about an alternative, especially for ultra-light packing. Tablets are light, but take a long time to work, and taste terrible. Filters (yes, I still like them) aren’t super-light, but will remove floaties, and they work quickly. Is there an in-between? Something that is light, works fast, and can clean up the water a little? Of course there is! It’s called UV light. Pairing a SteriPen with a small funnel-filter to remove chunks (which is entirely my preference. 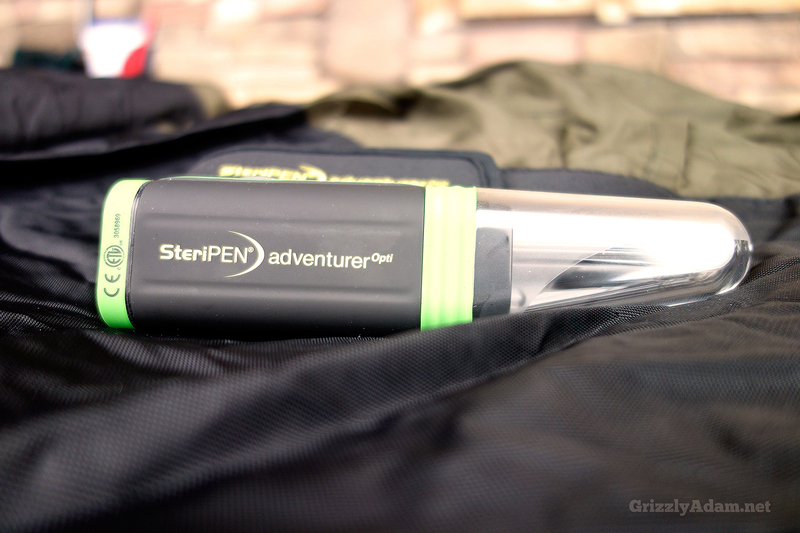 The SteriPen can be safely used without the filter) is light*, fast, and doesn’t alter the taste of the water. *Light. Get it? Ohhhh, it hurts. I’m a dirtbag. I can go a long time without brushing my teeth or showering. But if I don’t have to, well, I’m not going to. What, you thought I was going to leave the camera home? No way. I’m bringing my favorite point and shoot, the Sony RX100. I’m also going to bring a mini-tripod. For an extra 3 oz., it’s well worth the weight for the chance at some long exposure pictures. A long list of stuff I will carry through the Colorado Rockies, along with about 4 liters of water and 8,000 calories of food. I think it’s about time to start testing all this book learning with some pedal turning. Just as soon as I get back from the Caribbean, of course. Finish or not, CTR still on the top of my list for one of the best on-bike experiences EVER! You’ll love it!!! Very cool. Excited to see your updates on this. I’m just going to copy your gear list, k? I’m planning to do some practice trips beforehand too. Soon. Copy away. That’s mostly what I did. Let’s get together for those practice trips. You and Rich planning on the CTR? Why the rear flasher? Are there roads? Yes. A few of the Wilderness detours require riding on dirt and paved roads. Most road detours aren’t bad at all (traffic-wise), except for 285 between Bailey and Kenosha Pass, a 20+ mile detour on a 2-4 lane highway with high speeds (55-60 mph posted speeds) with a portion having little to no shoulder. Very dangerous during high traffic with lots of trucks (not bad during off peak times). I hit it last year (going up, not like this year where everyone will hit it going downhill) during a major storm and couldn’t see more than 10 feet and I knew cars had trouble seeing me. But with everyone going downhill on 285 for this year, it will go by very fast and shouldn’t be too bad traffic-wise (provided you don’t hit it during peak time, i.e. Friday or Saturday Evening). My goodness. That sounds like it is going to be an epic journey. I’ll be honest and say I don’t know much about the trip you’re doing, but it sounds like it is going to be a fantastic one. I imagine that it would take a ton of willpower in order to bike that much and stay consistent. You repair kit list is great. I may have to double check what I have in mine, and add a few things. Which part of the race do you think will be the hardest? Now this is a realistic list! Thanks for sharing. How do you judge your water supply? When to fill it up or when to pass it up and keep on truckin? If I’m in an area with abundant water, I’ll just fill up when I’m empty. If the route is more arid, with fewer water spots, I’ll top off any chance I get! I like to have 150-200 oz. capacity for most trips. The cinch straps that connect the saddle rails to the rear pack reliably come loose over bumpy track. On bumpy descents, they come loose after only a few minutes and cause the pack to hit the tire and wobble side to side a lot: Descend, stop, re-cinch, descend, stop… And furthermore, one of these days the plastic clips, that are probably under-built for the possible loads/impacts it must sustain, will probably break rendering the thing useless. I started using a trusty Voile ski strap as a backup to the existing cinches and presto. Other than that, I like the packs a lot. 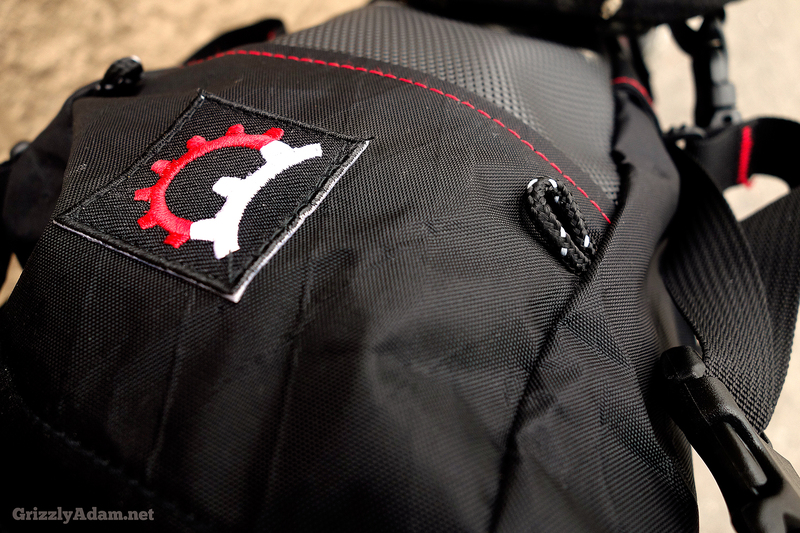 On the Revelate website, it indicates that he recently re-designed the seat bag to address this issue. I bought the seatbag in 2012 (before the re-design) and I did have to occasionally re-cinch when it started to come a little loose and rub on the rear tire on rocky descents – a bit of a pita but not a big deal but glad Revelate re-designed it. My Pika was rock solid over 100 miles last weekend, many of them on some rough terrain. I never had to make any adjustments at all. I was very happy with it. I’m with Jeff – CTR is one of the best bike experiences out there, right up there with the Grand Loop. 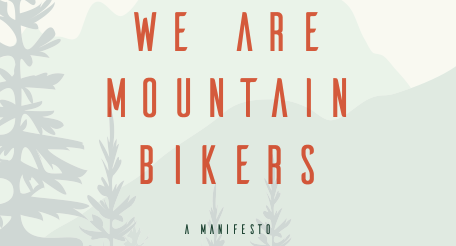 Thanks for the list, I’ll be dipping my toe into the Great divide trail by riding from Banff to Whitefish this summer. If it feels good then I’ll be in for the long haul next year.